Tm’s Custom Woodworking is a luxury kitchen and bath cabinet manufacturer with a network of designers in Canada and the United States. Our showroom carries a collection of door styles, hardware and accessories. 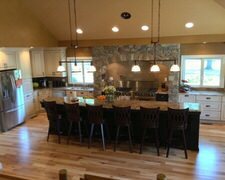 Tm’s Custom Woodworking provides high quality custom cabinetry at an affordable price with the best service possible. Over the years we have seen tremendous growth and have become one of the leading kitchen cabinet companies in the area.